Emergency and disaster management briefing for April 12, 2019: A gas explosion killed one and injured 17 others in Durham, NC -- including one firefighter; a blizzard slammed the Rockies before dumping more than two feet of snow on South Dakota; the NWS cautions that flooding from this bomb cyclone is likely to impact Midwest farmers already devastated by the March storm; authorities in Maryland thwarted an alleged plot to drive a stolen truck into pedestrians near the National Harbor; blizzard conditions halted grain processing across the Midwest and Plains; an American Airlines flight was forced to return to JFK Airport after striking an object on departure; Minnesota's governor signed a state of emergency for 64 counties and three tribal nations and mobilized its National Guard due to the blizzard; and an aluminum ore train derailment in China killed 4 and is the latest in a string of industrial accidents to plague the nation. 1) One person is dead, and a firefighter was among 17 people who were injured -- several of them critically -- by a gas explosion in Durham, North Carolina on Wednesday. The explosion leveled a two-story office building downtown that also included some retail space, then erupted into a major fire that took several hours for firefighters to contain. The incident occurred as officials and first responders were evacuating the area after a gas leak had been reported at around 9:38 -- about 30 minutes prior to the explosion. 2) Beginning Wednesday, a blizzard moved through the Rockies delivering more than a foot of snow and winds gusting up to 65 mph before moving into the U.S. Plains and Midwest. The strong winter storm was the second bomb cyclone to hit the region in the past month. It forced multiple road closures due to zero visibility, high winds, and blowing snow, and also prompted the closure of dozens of schools and government buildings. The blizzard dumped over two feet of snow in South Dakota and also delivered rain, sleet, freezing rain, and thunderstorms, all of which has caused widespread power outages in multiple states, including Minnesota, Iowa, and Michigan. 3) The National Weather Service (NWS) stated that the current bomb cyclone could trigger additional flooding in areas already devastated by floodwaters from an earlier storm in March. The March storm devastated farmers in Nebraska and Iowa, causing at least $3 billion in crop damages, while several areas in Iowa and South Dakota surrounding the Missouri River are still at flood stages. While most of the precipitation from the current storm came in the form of snow, melting snow will threaten areas already saturated by earlier floodwaters, which is likely to lead to additional flooding. 4) Authorities in Maryland believe they thwarted an alleged plot by an individual who was inspired by the 2016 Nice, France attack involving a box truck that plowed into pedestrians at high speed. Earlier this week, police arrested Rondell Henry, 28, of Germantown, Maryland, after he stole a U-Haul and parked it in National Harbor. Authorities allege that after he was arrested, Henry stated he wanted to create "chaos and panic" by driving into pedestrians in the busy shopping and entertainment complex alongside the Potomac River. According to his statement, he was not going to stop. 5) In areas already devastated by floodwaters from the bomb cyclone in March, many companies were forced to close grain processing and elevators due to heavy snowfall. 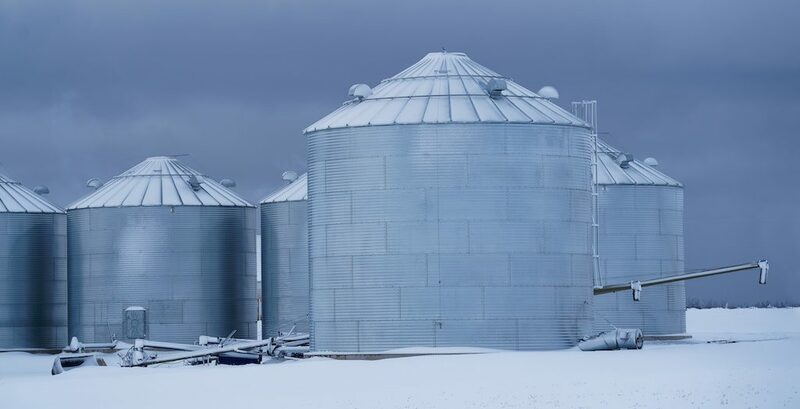 The high winds and heavy snow were also preventing farmers from pulling grain out of on-farm storage for processing, even if processors and elevators were open. Currently, no disaster relief program exists within the Agricultural Department to help cover the catastrophic losses of grains in storage, including those just destroyed by widespread flooding in March from the first bomb cyclone. 6) An American Airlines flight was forced to return to the airport following its striking of an object during its departure Wednesday evening. Flight 300 was carrying 101 passengers and eight crew members when it departed New York's John F. Kennedy Airport (JFK) for Los Angeles, and witnesses said they had to return to the airport because the plane struck an object. The flight departed JFK at 8:40 p.m. and landed safely back at the airport in New York at around 9:09 p.m., where passengers were accommodated on another aircraft. 7) Blizzard conditions that brought down power lines and caused flooding prompted the governor of Minnesota to mobilize the National Guard to assist with power restoration and rescues in several counties. The governor signed a state of emergency declaration for 64 counties and three tribal nations on Thursday, which prompted the mobilization of the Guard. The storm, which was still ongoing as of late Thursday, had already resulted in hundreds of vehicle crashes, multiple road closures, and hundreds of delayed or cancelled flights out of the Minneapolis-St. Paul International Airport. 8) Four people are dead and two are missing, following the derailment of an aluminum ore train in China. The 25-car train jumped the tracks around 10:00 p.m. Wednesday evening in an area of Gongyi, Henan province, and crashed into a village home. According to reports, the train, which was traveling on tracks built in the 1950s specifically to carry ore, lost control on a downhill section, causing the locomotive and the first 13 cars to jump the tracks.